Holt Renfrew for the Holidays! I was honoured a few weeks ago to be invited by Carla Stef - Marketing Manager Holt Renfrew Vancouver - to a holiday media event held in the Vancouver store's brand new Holts Café. I love this store, had the privilege of interviewing Stef a few years ago and am a huge fan of their H Project Shop where I've made several purchases. I jumped at the chance to check in and see the new space. 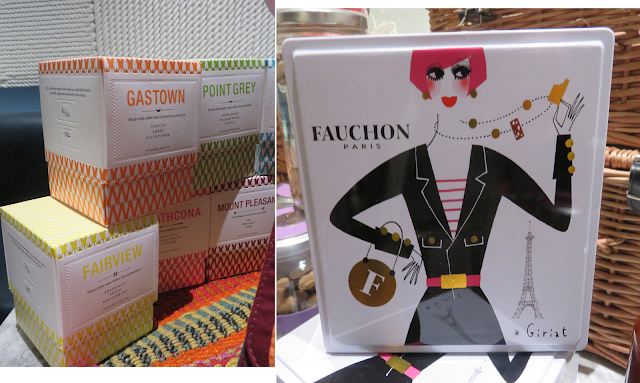 It was a relaxed, low-key evening for media to check out the cafe and hear about what's new at Holt Renfrew. The cafe's distinctly West Coast interior was designed by internationally acclaimed Canadian design group Yabu Pushelberg. Fabulous bites - both sweet and savoury - were offered throughout the evening created by the cafe's executive chef. Standout for me was the chocolate dessert cone sprinkled in edible gold. 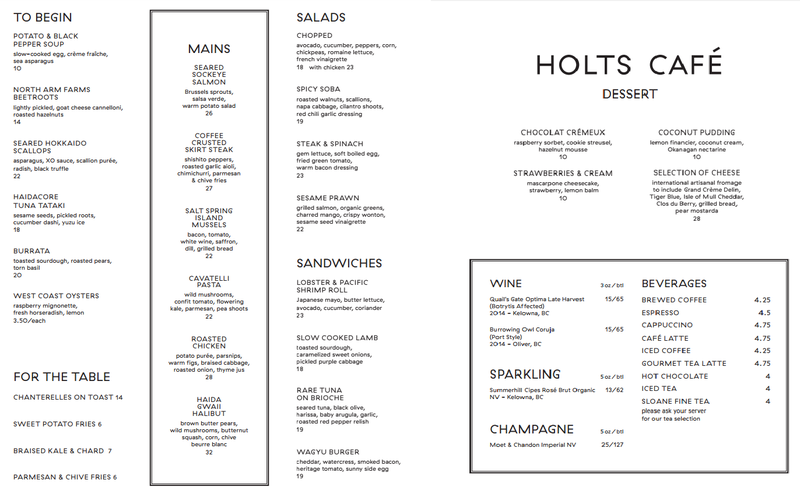 I have included a copy of the current menu below, but be sure to check before you come as it might have changed. There was a brief talk by Alexandra Weston, Director Brand and Creative Strategy, Holt Renfrew - where she shared a bit about Holt's direction and some of the things she was most excited about. 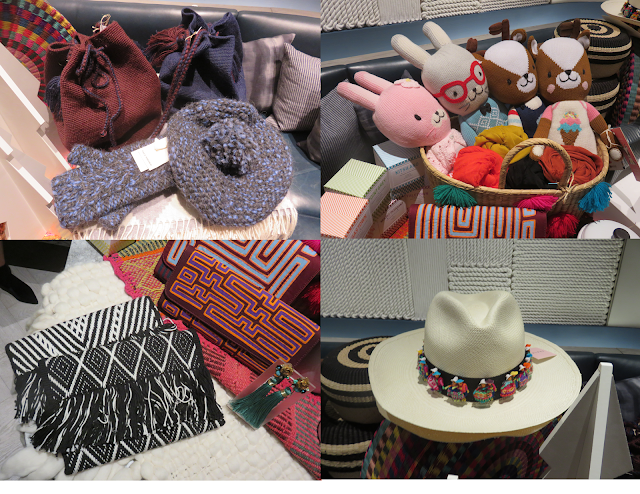 Then there was time to peruse several tables chock full of smaller gift items, each with it's own focus. As I am a fan of the company's H Project Shop, that was my first stop. 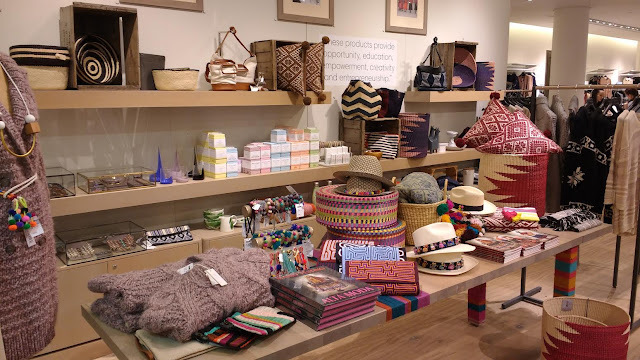 I have to admit, just a couple days ago I headed back to the store to snag both a woven clutch and an amazing coffee table book of traditional Peruvian fashion images. H project gift ideas! All from South America! We ended the evening with a swag bag featuring several items I had seen including a candle that was Vancouver specific with each offering a scent in honour of a local neighborhood and a beautiful scarf by Obakki. The evening from start to finish was lovely and a fabulous chance to catch up with many industry friends as well as see what was new in this amazing store. Check out those Vancouver Neighborhood candles on the left! Do you still have some last minute shopping to do? Then I suggest you head downtown today. While there be sure to check out the H Project shop on the second floor and the gift gallery on the walkway on that same floor. Both have tons of ideas that are sure to delight! 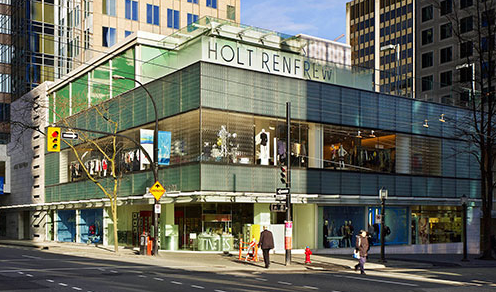 Holt Renfrew Vancouver is located at 737 Dunsmuir St. Holiday stores hours are in effect with lots of open times to accommodate your schedule - Monday to Saturday 10:00 AM - 9:00 PM and Sunday 10:00 AM - 8:00 PM. 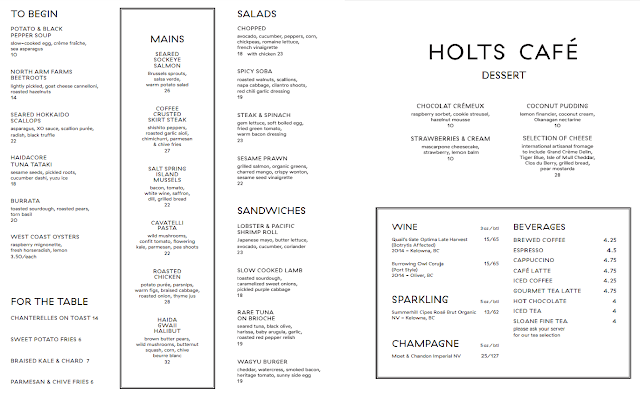 And while you're there picking up those last minute items, be sure and take a break and have a bite at the Holts Café! I am looking forward to sampling several unique items on their menu! Snapped this image of the H Project shop while I was there picking up my latest additions. It really is a must see!